28 February 2019 – Médecins Sans Frontières (MSF) has put on stand-by its medical activities in the epicenter of the Ebola epidemic, in the province of North-Kivu, Democratic Republic of the Congo (DRC), following an attack on an Ebola Treatment Centre (ETC) in Butembo city during the evening of 27 February. Unidentified assailants set some of the compound’s facilities – as well as vehicles – on fire. The blazes were contained, but the teams were obliged to immediately cease patient care. At the time of the attack, there were 57 patients admitted in the ETC, which was run alongside the Ministry of Health, and of these patients, 15 were confirmed to have Ebola. 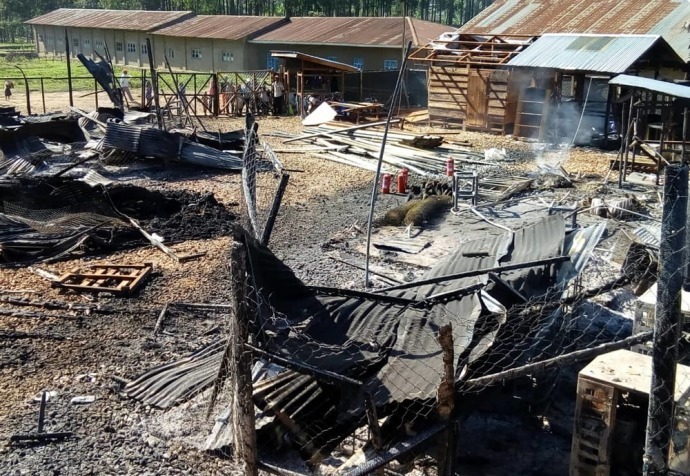 This incident comes only days after another Ebola treatment facility, also supported by MSF teams in the neighbouring district of Katwa, was attacked on 24 February – also forcing its suspension. MSF has evacuated staff from the area for their safety pending a thorough analysis of the risks associated with continuing to provide medical care there. No staff or patients were harmed, but both attacks were traumatic for patients, their relatives and staff who were inside the centres at the time. The caretaker of one patient died during the attack on the center in Katwa, allegedly when he tried to flee. Almost seven months after the beginning of the current Ebola outbreak in the provinces of North-Kivu and Ituri, there have been 879 confirmed cases of Ebola and 553 people have died. In addition to the treatment centres in Butembo and Katwa, also manages Ebola-related activities in the North Kivu towns of Kayna and Lubéru. MSF runs two Ebola isolation facilities in Ituri province, in the towns of Bwanasura and Bunia. In the city of Goma, MSF has been supporting emergency preparedness by reinforcing the surveillance system and ensuring there is adequate capacity to isolate suspected cases.